We are left with the “leave it to evolution” strategy. Since life began on Earth, survival of the fittest has been a contest decided by the effective use of each species’ strengths. A strength might be an aggressive asset such as speed, size, or strength, or it might be a defensive asset such as the tortoise’s shell or the chameleon’s camouflage. Humanity’s greatest strength is its intelligence. Any solution to today’s problems must come from that source. We have come to the crux of the matter. Tigers, lions, ants, bees, and all the other life-forms on Earth must leave it to evolution—they have no capacity to make a choice. They have no capacity to even know that there is a choice. We, humanity, the end-product of a sequence of events that began 13.7 billion years ago, are different—we are gifted with intelligence. We have been given the most wonderful, but at the same time the most burdensome, decision to make—and our future, and perhaps the future of all life on Earth, awaits our decision. We must face this as a responsibility—and move forward to our destiny in the universe. God awaits our decision—and we come back to the question, “What is our concept of God?” Is God the god of the tribes, manifesting in myriad forms, each tailored to a particular segment of humanity? Is God the pessimist that expects only human frailty? Is God the fundamentalist, the traditionalist, who wants humanity to just replay its lifestyle, morals, and norms of a thousand years ago? Is God merely the watchdog and judge of individuals, attaching “go to heaven” and “go to hell” stickers to us as we live out our lives? Is God and His works cast in stone in man’s holy books, doomed forever to be seen only though the expert interpretations of priests, rabbis, and imams? Or is our concept of God to be a new unifying concept that is consistent with modern man’s reason and knowledge? There can only be one answer—just as there is only one God, a God who sees all of humanity as His children, His hope for the future. A God that exists on rational grounds and does not depend on scriptures, visions, and miracles that favor a chosen few. A God who will tear down the divisions between us and prepare us, united, for a noble future. 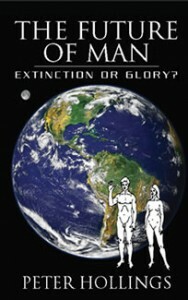 Having considered the foundation for a new concept of God, we need to do the same for future man. Some readers may already have realized what that concept is. The concept flutters through the previous two chapters like a butterfly that we see out of the corner of our eye. We think it is there, but we are not certain. A butterfly metaphor is apt for our new concept of man. Think of our beginnings. The 13.7 billion years from the time God created the universe produced a caterpillar that we can all hope bears little resemblance to future man. In the butterfly metaphor, we have just emerged from our cocoons. Our wings are our fledgling intelligence. We are aware of God, and we dare to think that there is purpose to our existence. Our past is ugly, and the present is insane, but the future is, or could be, unsurpassingly beautiful. Now we must use our wings to bring the future to us. Unified by a new concept of God and a commitment to fulfilling His purpose, man can have a truly noble future. If we do not self-destruct or fall prey to an extinction event, we could have billions of years of evolution ahead of us. Considering how far modern man has come in the scant 50,000 years of his existence, that is an eternity. The sky (or should I say, the universe) is the limit! We could become superhuman, our intelligence might grow to the point that we actually come up with all the answers—we could even achieve the ability to set the stage for the next instance of a life-friendly universe. Now that is purpose for man!